Want to learn to make your own landscape woodcuts? 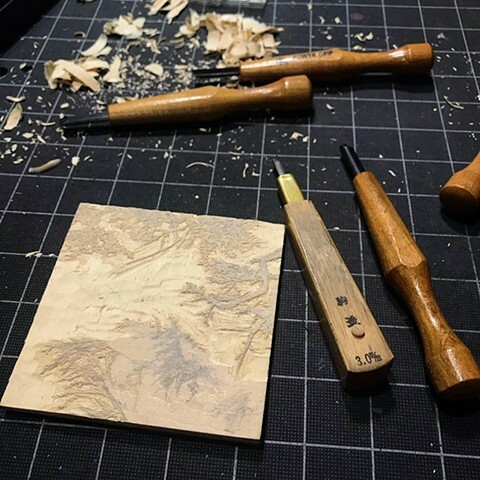 This course is an introduction to relief printing, focusing on landscapes in woodblock. 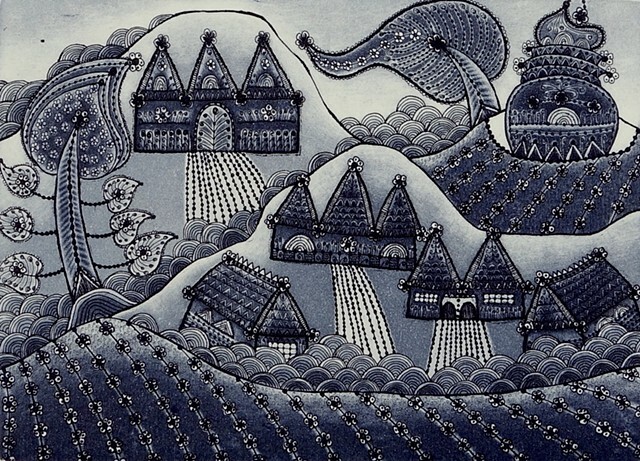 Skill and technique will develop as class participants create landscapes through reductive relief printing techniques. Class participants will learn how to employ safe wood cutting techniques, use oil-based inks, and generate original prints. Students will work from photographs or drawings to design, carve, and print their own landscape studies. Upon completion, participants will have an expanded toolkit of visual arts vocabulary and way of thinking artistically through the production of original and contemporary prints. Carving tools will be available to share, but you may bring your own. Nikki recommends the Power Grip carving tools, available on Amazon. These tools are carried locally by Rockler’s near Northgate and in South Center. Share the love—you get a $10 refund for every person who signs up because of you! This class must have at least 6 people to run. If you have any questions about this class, please contact the coordinator sarah@editions.studio. Seattle- Thailand Print Exchange has a show in Seattle! Featured artists include (from Seattle): David Bradway, Romson Bustillo, Amber Chiozza, Claire Cowie, Trevor Foster, Kerstin Graudins, Keiko Hara, Virginia Hungate, Kamla Kakaria, Scott Kolbo, Brian Lane, Ben Moreau, Tyna Ontko, Mike Schultz, Kim Van Someren, and Charlie Spitzack, and (from Thailand): Minchaya Chayosumrit, Kraisak Chirachaisakul, Theerayuth “Lek” Inkaew, Srijai Kuntawang, Luntau, Patcharin “Nok” Meelarp, Praween Piangchompu, Orn Thongthai, Kittikong Tilokwattan, and Sirinapa “Noom Nim” Thongsuk. 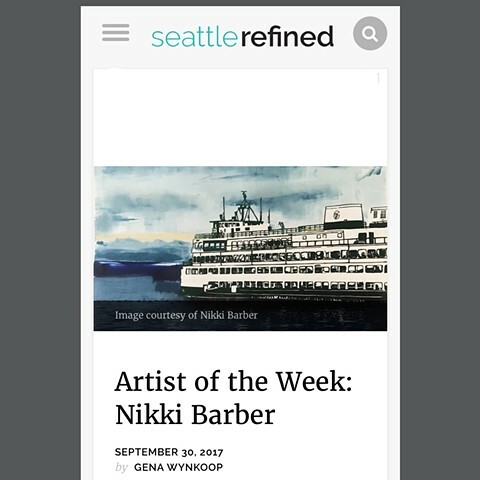 I am so honored to be featured on the Seattle Refined Blog. Check out the interview below! Carving is one of my favorite parts of printmaking. 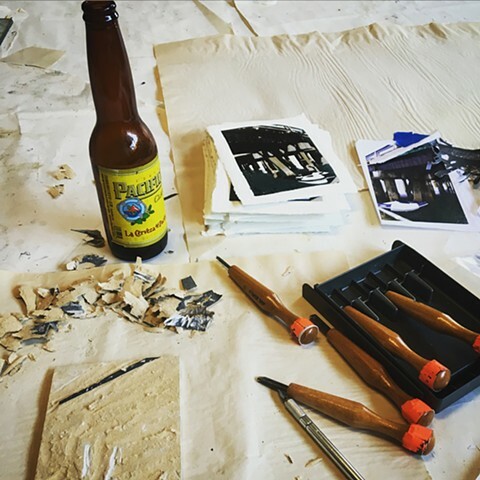 At my studio in Seattle, WA I love spending time on my woodblock carving with a beer!